It’s about 11 on a bright and cold Sunday morning. Instead of being cuddled up in my bed in Brooklyn after a boozy Saturday night, I’m in the Upper West Side. I'm out of breath and my adrenaline is pumping. I just finished (gently) poking and slapping women I’ve never met before - and vice versa - careful not to step outside of a red foam rectangle the size of a twin bed. Sprinkled throughout the white walls are black and white vintage photos of a 40-year-old man, who looks like he’s on vacation with polyester pants, a polo and a fisherman’s hat, fighting off muggers. The phrase “Krav Maga. Saving lives since 1948,” is written above the entrance of the International Krav Maga (IKM) center on West 100th Street. Tsahi Shemesh, IKM’s USA director and chief instructor, also has us run barefoot around the red and blue padded room. We leap, look and drop, and shoot back up to warm up before we get into the techniques. With about seven other women in yoga pants and painted toenails, I’m learning how to defend myself using the Israeli self-defense method. 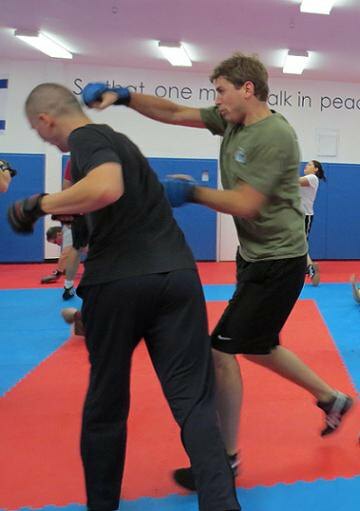 Krav Maga, which means “contact combat” in Hebrew, is a noncompetitive self-defense technique based on natural human instinct and is the official self-defense and combat system of the Israeli Defense Force (IDF). 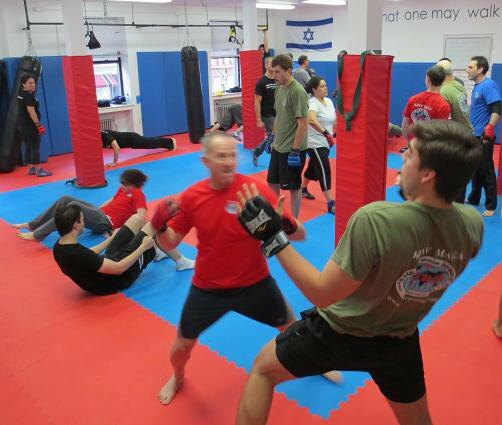 The practice, created and continually developed by the Slovak-Israeli soldier Imi Lichtenfeld, combines martial arts, wrestling and boxing techniques for a no-rules combat and prevention system. 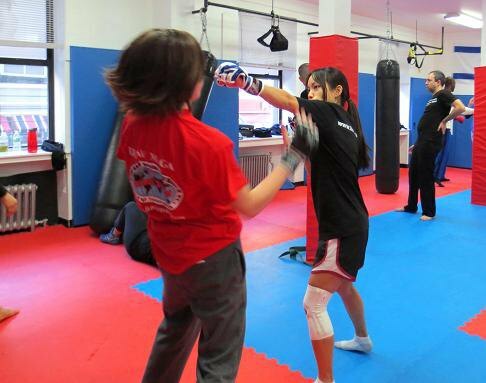 “Knowing Krav Maga means having the freedom to be who you are without being afraid,” Shemesh said. What separates Krav Maga from other forms of self-defense and martial arts is that Krav Maga isn’t a belt system. It’s situation-based, meaning it will teach you to defend yourself in real threat situations, such as an attack from behind or a knife assault. It teaches you how to survive on the streets, where there are no rules, so kicks to the groin, pokes to the eye, or bites to an ear are all perfectly acceptable. The goal is survival. The method also focuses on mastering the techniques, rather than the size and strength of a person, making it an ideal practice for smaller, weaker and older women, as well as men. Knowing Krav Maga could definitely come in handy in Bushwick where there have been a string of attacks on women since December 2012. Claire Lacroix-Bouchardie, a 29-year-old French citizen now living in Manhattan for two years, ultimately decided to take Krav Maga classes at IKM after a fifth attack in Paris. The assault happened around 11AM on a Tuesday in the desolate financial district of Paris while she was with her colleague, an American “built like a football player.” The robbers quickly knocked him unconscious first with a surprise attack, and then pushed Lacroix-Bouchardie against the wall with her head down until she released her purse. “The first four [assaults] I felt like a victim, like I was in an inferior position, but the fifth time I was angry. It had to stop because the next time I might end up in the hospital,” Lacroix-Bouchardie said. Although she feels safer in New York than in Paris, she still decided to take the classes. “After four classes, I feel more confident because I feel empowered to do something,” she said. Similarly, Lina Gonzalez, a 25-year-old Brooklyn resident, has been taking Krav Maga at the Krav Maga Institute NYC in Tribeca for nearly a year and a half. Gonzalez, who now lives in Kensington, said she decided to take the classes because there were a string of muggings and shootings in her previous neighborhood of Lefferts Gardens. Patrick Lockton, Director of the Krav Maga Institute NYC in Tribeca, said Krav Maga teaches people to use common sense and objects they already have with them, like their voice, keys or handbags. It also teaches people to be aware of their surroundings. “We teach a lot about distances and prevention. Rather than waiting to be attacked, if you can get away from a situation, it’s better than having to deal with one. Prevention is a really important part of what we do,” Lockton said. A positive side effect of learning Krav Maga, Lockton added, is that his students not only feel confident in dangerous situations, but also in social situations.